When arriving at Faro airport on Wednesday, little did we know the 6th round of the WRC Series would be an historic weekend for the World Championship. Rally King Sebastien Loeb, arguably one of the greatest drivers ever seen, was beaten by the young pretender to the throne. In the last 5 years only three drivers have been able to beat Loeb. It nearly happened in New Zealand and on 30th May 2010, the young French pretender, Sebastien Ogier drove flawlessly to secure his first ever World Championship victory. My first visit to Portugal was also my first time with Rally travel. Having arrived at Faro airport in the heat of Portugal on Wednesday, I was greeted by a friendly & entertaining Neil Prunnell from Rally travel who then kindly escorted us to our hotel in Villomour. Once settled in it was time to relax in the marina. We kept running into the WRC guys. First Carlos Sainz having dinner, Henning Solberg going for a quick swim at the beach. Matt Wilson with Fitness trainer Barry Johnson going for a run and a very excited Kimi Raikkonen on his way to Pizza hut. After Shakedown, myself and a few other Rally travel guest went to Petter Solberg World Rally Team’s service. Where Petter was happy with the set-up of his car saying “I was second fastest to Ogier by just a few tenths, the car is good, a bit of dust coming in (After New Zealand crash) but its on the co-drivers side so its ok”, he said with a faint smile. The rally started with a Super Special in the Algarve Stadium. 2007 F1 Champion Kimi Raikkonen and stunt driver Ken Block were first of the ‘Big boys’ and set an identical time, Petter beat his older brother, but the real battle as always was Loeb and Hirvonen. Hirvonen beating Loeb to take the overall lead. Friday Morning the Crews hit the Gravel stages as we headed to the Silves stage. With our VIP mini-bus parked just a few meters from the stage, I climb up in with the crowds, which at first was great, being so close to the action, but it had its drawbacks. The Dust! With every passing car came a great cloud of dust so thick that you couldn’t see your hand in front of you. By the time Wilson passed us we had turned Orange. Loeb done his usual ‘Road sweeping’ duties, ending day 1 in 3rd 18.2 sec down on his Citroen team mate Sordo, who was in 2nd. Rally leader Ogier didn’t have too many worries about being first on the road for day 2 after being fastest on five of the six stages. Hirvonen was 4th after backing off to preserve his tyres. Petter 5th in his privately-run C4 who had dropped time when he overshot a junction on SS4. Day 2 we were ‘bussed’ off to Aldomovar Stage. After an up-date by Neil he recommended a café to us, but warned me about the low door beam when exiting. Of course I walked in, forgot his advice, when I left I found myself seeing stars and not understanding how I managed to fit in through the door the first time but knocked myself out the second time. After the repeat of the stage we headed to service. Surprisingly after road sweeping Ogier reached the end of day two 21 seconds. And with just four gravel stages remaining on Sunday, Loeb fears he might not be able to prevent Ogier from landing his maiden victory. In 3rd was Petter, with Sordo 4th and Ford’s Mikko Hirvonen 5th. I walked into Fords hospitality & was surprised to see a disappointed Latvala. I began to think about his ‘monster’ crash last year when he rolled down the mountain side. Fearing the worst I asked him what happened. He replied, “I came too fast into a corner and got off line, I then went wide and hit the bank with the front which then spun me around and I went backwards into the only tree that was there”. The guys then drag the car off the truck to see if he was able to continue. Unfortunately putting a tree two feet into the backend of his focus caused to much damage. Day 3 and we got to the stages just as the sun was getting up. But the big question was, can Ogier beat the 6 time world champ. With Ogier sweeping the dusty bedrock stages, Loeb was pounding down on him, they went into midday service with Loeb just 10.1 seconds behind. The pressure was on the young Frenchmen. On the second loop the gap had closed to just 7.7. We had a new winner. 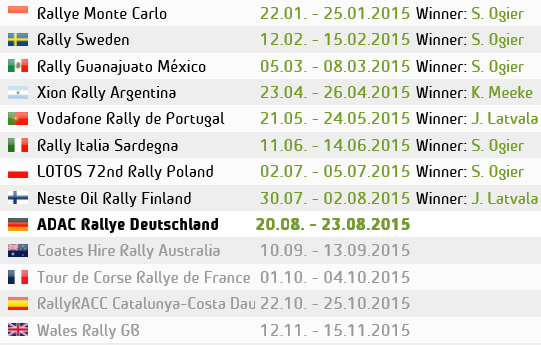 There seems to be a small French revolution happening in the WRC. Will Ogier become the new Loeb?….. And what can Ford pull out of the bag to stop Citroen’s dominance? One things for sure, if Ogier keeps it up, he will one day be World Champion . This entry was posted in WRC and tagged citoren, ford, Loeb, Ogier, Rally portugal, WRC. Bookmark the permalink. There is no doubt about it that Sabstien Loeb is one of the World’s Greatest Rally Drivers. However I think we are begining to see the younger drivers starting to come through, drivers that have the potential to actually beat Loeb.I think we should watch out for drivers, as you rightly mentioned, like Sebastien Ogier who can, in his own right make it onto the podium. I think we should watch this space.